Desk bar. Where everybody knows your name. This nameplate is simple. And sometimes simple is the best way to go. The plastic plate can be purchased alone, or in an unpretentious gold or silver metal sign holder. Simply irresistible. Optional metal sign holder for desk or wall. 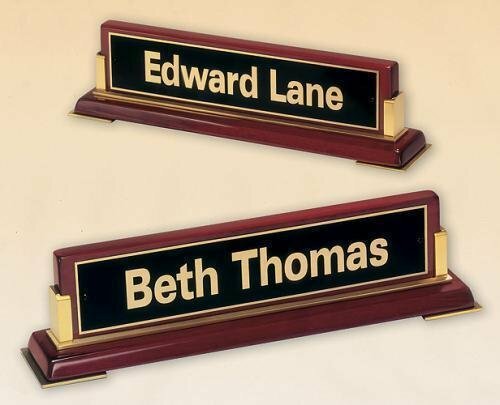 Thick 3/8" clear jade glass deskbar name plate with two brass feet. Your text laser engraves a frosted white. Individually gift boxed. The solid walnut desk name bar presents you to the world in a business-like manner. It features an engraved metal plate. Individually boxed. Available with or without a slot on the top to hold business cards. The solid walnut desk bar features your name laser engraved directly into the wood. Individually boxed. The rosewood piano finished wood and the black engraved plate set this desk bar apart. 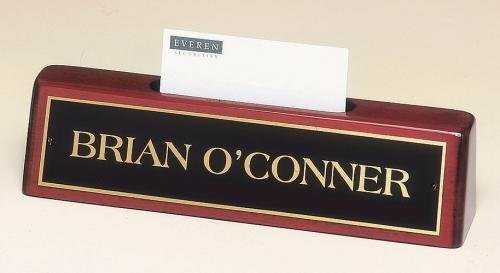 An incredibly handsome desk accessory, bar none, for corporate name recognition. Individually gift boxed. Wood wedge deskbar with a rosewood piano finish for an elegant look and feel. Has a slot on top to hold standard 3-1/2" long business cards. Laser engraved metal name plate.